Canine Companions graduation ceremonies honor people with disabilities placed with specially trained assistance dogs nationwide. 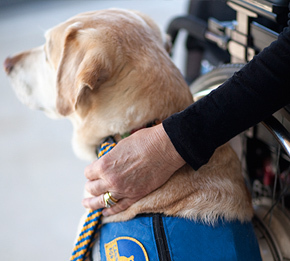 This celebration marks the end of an assistance dog’s professional training and the beginning of a partnership between a human in need and a canine that will provide endless service and companionship. Graduations are open to the public^ and a wonderful event you won't forget. ^Service Dogs for Veterans with PTSD ceremonies are not open to the public. Click here to watch past graduation ceremonies and other great videos.